Konnor began playing as a session drummer at the age of 17 mostly, playing local functions and pub gigs. He has since gone on to be a well-known drummer in the South of the UK. At the age of only 18 he started work as a professional studio session drummer in and around Southampton, performing on numerous recordings whilst occupying the drum chair in several local bands. Through his studio work, Konnor has featured on many recordings and also music videos for studio clients and he came to know the UK renouned Bassist Chris Wood. This connection has enabled him to link up with many of the artists he works for today such as Tara Flanagan, Izzii Moulsdale and En Masse; both as a studio drummer and live performer. 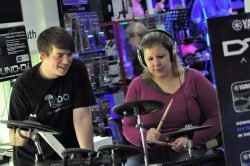 Konnor’s professional attitude, combined with a fantastic technical ability, has quickly elevated him to be one of the South’s first-call studio and live drummers.. He is also a qualified pilot and when he’s not behind a drum kit, he can often be found in the skies above southern England. Rosie WXYZ clip1 from Glen Jevon on Vimeo.